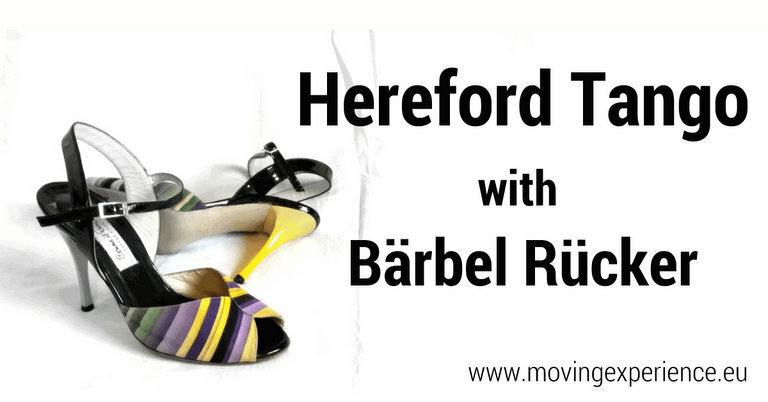 Weekly Tango Classes with Bärbel Rücker at Hereford Tango. Mondays at Breinton Village Hall, Hereford. Organised by Jim Didlick. My Hereford Tango Classes run until 2nd July 2018. As usual on a Monday evening at Breinton Village Hall. These weekly Hereford Tango lessons are organised by Jim Didlick. Be informed about my upcoming tango events in Hereford. The tango classes will focus on the social dance skills (embrace, connection, musicality, floor craft) and the quality of the movement. Each class will support you in your own tango journey – from beginners to experienced dancers. Challenges and feedback will be given individually. I would like to encourage anyone who would like to learn the ‘other role’ to come and join. Everyone is welcome, even if you haven’t been yet! Tango class cancelled : 26th February & 5th March. Tango practica cancelled : 19th March & 30th April. Please join us at The Magic Roundabout Milonga in Kington Langley. Tango class cancelled : 18th June.